For a democracy to function properly, its citizens need to be informed. In order to encourage this and make providers more accountable, the US has implemented performance accountability measures for public and private goods and services. In new research, John B. Holbein examines the effects of the No Child Left Behind policy, which gives citizens information about school performance. He finds that when schools fail not only does voter turnout in school board elections increase, but the number of parents – especially the affluent – who quit the schools increases. Information is necessary for democracy to function properly. When citizens are informed, they are more likely to hold elected officials to account; when they are not, they are less likely to do so. Unfortunately, in many democracies, the predominant majority of citizens are strikingly uninformed about government, politics, and the performance of public institutions. Perhaps even more troubling, citizens’ levels of political information are unequally distributed—with advantaged citizens being much more informed than their disadvantaged counterparts. Recently, a set of public policies have tried to address this problem. Performance accountability systems provide information to the public about the quality of various goods and services. For example, several performance accountability systems have begun to publicise report cards on the performance of individual politicians, provide letter grades on restaurant cleanliness, or publish the performance of public services in health, transportation, and education, to name a few. The hope is that in so doing, these reforms will spark democratic accountability—stimulating citizens to voice their displeasure and exit (i.e. voting with their feet) when performance deteriorates. One of the most prominent performance accountability systems is the No Child Left Behind Act of 2001 (NCLB). Along with implementing a well-known system of standardized testing, this seminal education policy provided citizens with clear information signals about which public schools were “failing” to make adequate academic progress. As with other performance systems, these school failure signals were designed to provide citizens with the information necessary to help them hold local public officials accountable. Did NCLB succeed in doing so? Do citizens respond when they receive a signal that their school has failed? If so, how do they respond—by voicing their displeasure in local school board elections or by simply exiting failing schools? And, who is most likely to respond to such performance signals—advantaged citizens who are already likely to engage in schools and in politics or disadvantaged citizens who are not? To answer these questions, in my new research I bring together a number of big data sources that pair the performance of public schools with data on the level of voter turnout in school board elections, the competitiveness of school board elections, and the number and type of parents’ leaving local schools. 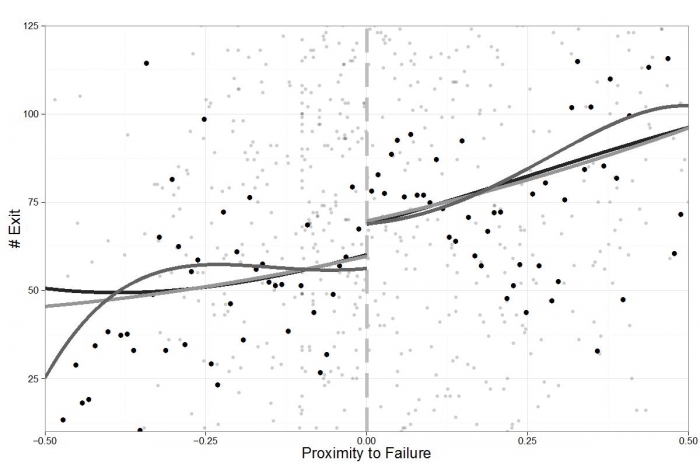 To estimate the causal effect of school failure signals on these outcomes, I leverage a natural experiment and a regression discontinuity design that compares schools close to NCLB’s arbitrary cutoff distinguishing failing schools from passing schools. 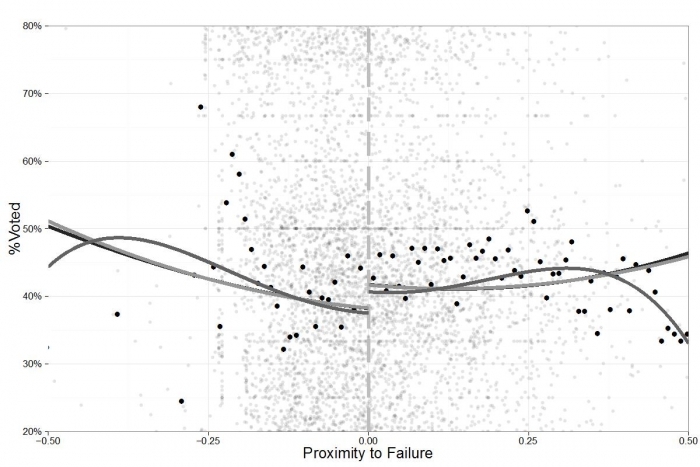 My results suggest that citizens do, indeed, respond when schools fail. School failure leads to a noticeable increase in voter turnout in school board elections, with these local races becoming more competitive as a result. Moreover, school failure signals increase the number of parents who exit failing schools. The figures below show these changes. They compare schools (points on the graph, with bolded points being averages along the x-axis) that marginally failed (the group on the right of the dashed line) to schools that marginally passed (the group on the left). The first panel plots voter turnout in school board elections on the y-axis, while the second panel plots the number of exits from schools on the y-axis. In both, the x-axis displays how close a school was to failing to make NCLB’s standards. Both graphs also plot various ways to specify the regression discontinuity models (the plotted lines). As shown in the figures, there is a jump in school board turnout and the number of parent exits from failing schools at the school failure cutoff (the right side of the graph). Simply put, these figures show that when schools fail, citizens respond—both by using voice to express their displeasure and also by exiting failing schools. Unfortunately, these responses are not universal. Citizens who are white, affluent, and have voted recently are much more likely to respond to school performance signals than minority, disadvantaged, or low-turnout individuals. This troubling pattern is especially present with parents’ exit patterns. My results show that NCLB’s school failure signals encourage advantaged parents to flee low-performing schools, leaving lower performing students behind. These results highlight that performance accountability systems, like NCLB, may be a double-edged sword. Although these provide citizens with valuable information about the performance of local public institutions, the signals these reforms provide exacerbate fundamental inequalities in citizen engagement and in school composition. Though NCLB was recently rewritten, the central components of measuring and publishing school performance remain in place. Moreover, performance accountability systems in other sectors continue to spread. My work suggests that performance accountability systems may struggle to achieve their objective of stimulating democratic accountability among disadvantaged communities. Thus, policy-makers should proceed with care—performance accountability systems may spur local accountability among some, but leave many citizens perpetually behind. This article is based on the paper, ‘Left Behind? Citizen Responsiveness to Government Performance Information’ in the American Political Science Review. It was first published at LSE USAPP. John B. Holbein is a Postdoctoral Research Fellow at the Center for Study of Democratic Politics at Princeton University. He has expertise on the topics of American political behaviour, political participation, education policy, and methods for causal inference. His work has been published in the American Journal of Political Science, the American Political Science Review, and Education Finance and Policy and has been supported by funding from the National Science Foundation.